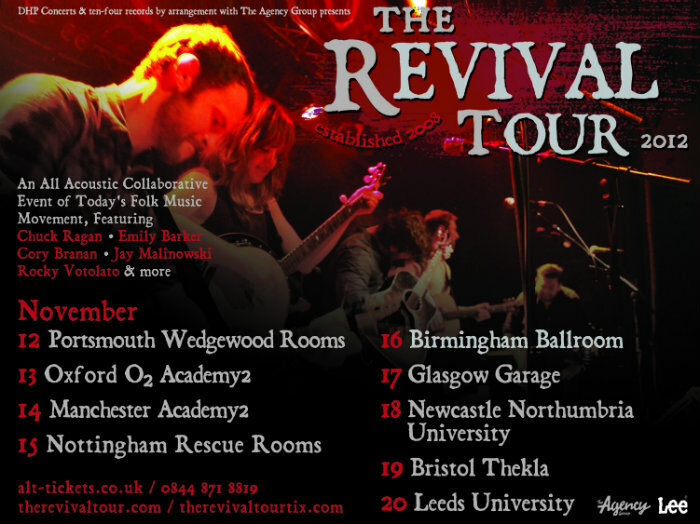 There are musical events that are just too good to miss – and The Revival Tour is one of them. Nothing screams ‘the traditional way of sharing music’ more than this collaborative acoustic event that was established by Chuck Ragan (Hot Water Music) five years ago. The target is to bring people a real musical experience through these shows and whoever’s been to see one of them knows, that this is absolutely the case. 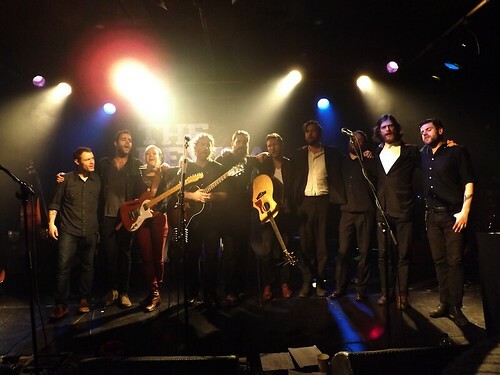 There is nothing quite like the Revival Tour, but you have to be a part of it to really understand this.The tour has been coming overseas for the past three years with a strong line up of musicians including Frank Turner, Brian Fallon of Gaslight Anthem or Dan Andriano of Alkaline Trio. 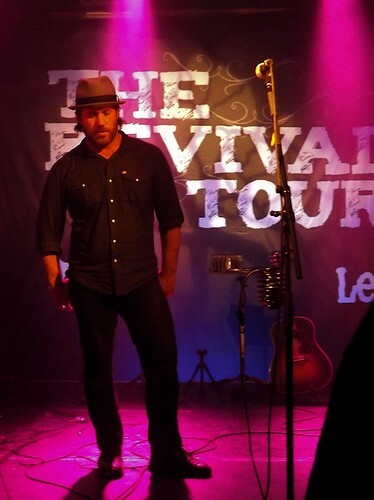 This year, The Revival Tour has been back at Wedgewood Rooms in Portsmouth with yet another fantastic combination of singers/songwriters and composers, ready to hit the stage with Chuck Ragan. Cory Branan, Emily Barker, Jay Malinowski, Rocky Votolato, Joe Ginsberg (double bass), Jon Gaunt (violin) and The End Tree (string trio), all enter the stage and are welcomed by great cheers from the crowd. They commence the show with a powerful ensemble performance, with each of the artist having their own introduction part while the others play and sing along. The voices and instruments blend together perfectly and you cannot imagine a better opening. Being able to see one of the shows also at the beginning of this tour; I notice that these artists have grown much stronger as a group over the past few weeks. The way they work and interact together on stage is what makes this whole event so special. Cory Branan, an excellent singer/songwriter from Memphis is the first one to play his solo set. He spots a little boy in the first row accompanied by his mother, greets him and makes a joke about having to watch his language now that there is a child in the audience, praising the mother for bringing him to the show with saying ‘I wish my parents were so cool’. The audience is still while he sings, taking in his mesmerizing performance. Tracks like The Corner or Prettiest Waitress in Memphis are the highlights and he even let’s a fan pick a song. Next up is Emily Barker, a folk singer from Australia whose voice is hauntingly beautiful, especially when she sings Nostalgia. She draws you into a different world with her captivating story telling. Canadian musician Jay Malinowski, who’s also the lead singer of a reggae band Bedouin Soundclash, brings something unique to the show together with the string trio - The End Tree. Their performance of I Was Walking Through A Dream is very moving, as well as a cover of Patrick Krief’s Forever Goodnight. Jay playing the piano is also one of the highlights of the night. You cannot dislike Texan Rocky Votolato. His set is fresh, full of great melodies and his voice is faultless. Little Spring sung with Chuck Ragan puts a smile on your face and the harmonica in Portland Is Leaving gives you goose bumps. The crowd is now ready for the one and only Mr Chuck Ragan. This man surely has a lot of fans in the audience. As he enters the stage and kicks off his solo set with Meet You In The Middle, the crowd starts moving along his uplifting music instantly. The energy in the whole room rises while Chuck puts all his heart and soul into the performance, as well as his pals Joe Ginsberg and Jon Gaunt, who are passionately fiddling away on the double bass and violin. Everyone in the room is now dancing and clapping to the beat of the striking melodies.